← WWII POW Camps in the Armstrong Station Area – The Real Story! time: 9:15 a.m to 11:25 a.m.
campsite: old Hudson Bay Post site – flattish area in the grass near tree stand; made room for our 4-person tent; other sites possible for 2 / 4 person tents; hammocks possible in the tree stand north end of the site; relatively (to very) open; semi-sheltered from north winds thanks to the tree stand. 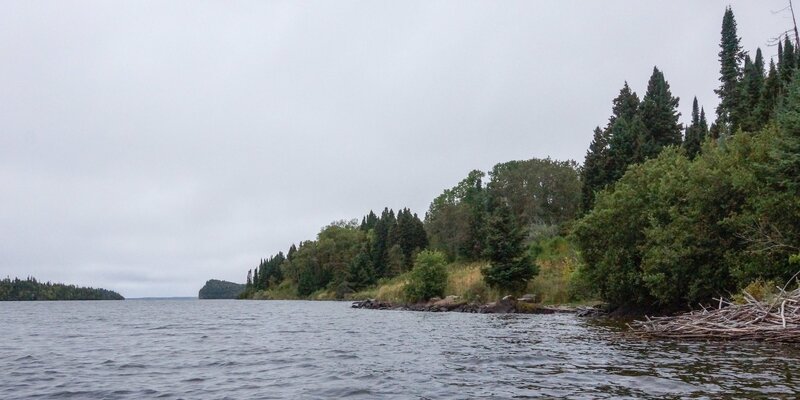 It was a breezy morning with a bit of drizzle as we set off on our paddle north to what we hoped would be our campsite that night – a spot on Wabinosh Bay or maybe on even on Wabinosh Lake itself. a view of Echo Rock from Underecliff I. the day before – not ideal weather! But first, we headed back to Undercliff Mountain and Echo Rock to check out the pictograph site. We had given the rock face a cursory scan the afternoon before but the strong wind from the south and the rain had prevented a more thorough look. Now the wind was blowing just as strong from the north but the rain wasn’t pelting down the way it had the previous day, as the pic to the left illustrates. it has more graffiti in the vicinity than almost any other pictograph site we have been to. The one thing we did not note was a pictograph! We had a rough idea of what we were looking for thanks to a brief passage in Selwyn Dewdney’s book. 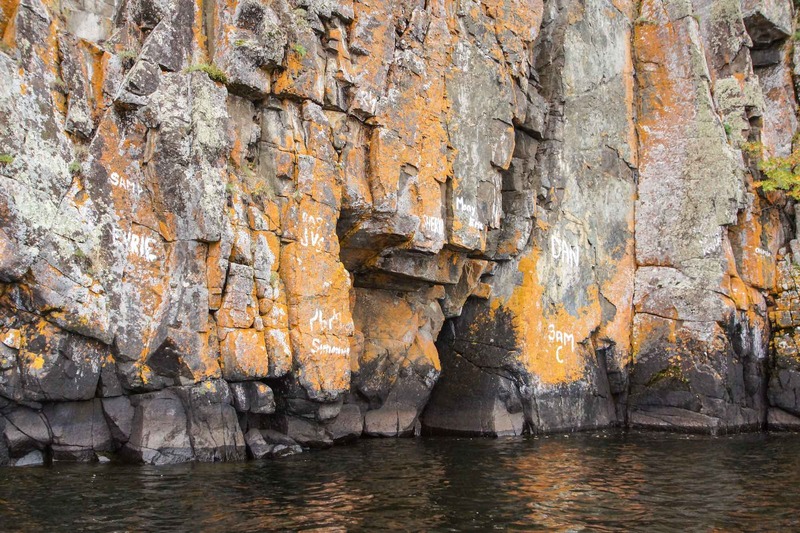 While he states that there are a number of pictographs to be seen, most sound like they have all but faded away. Even the one image he chose to sketch back in 1959 when he visited (60 years ago!) was already on its way to disappearing! 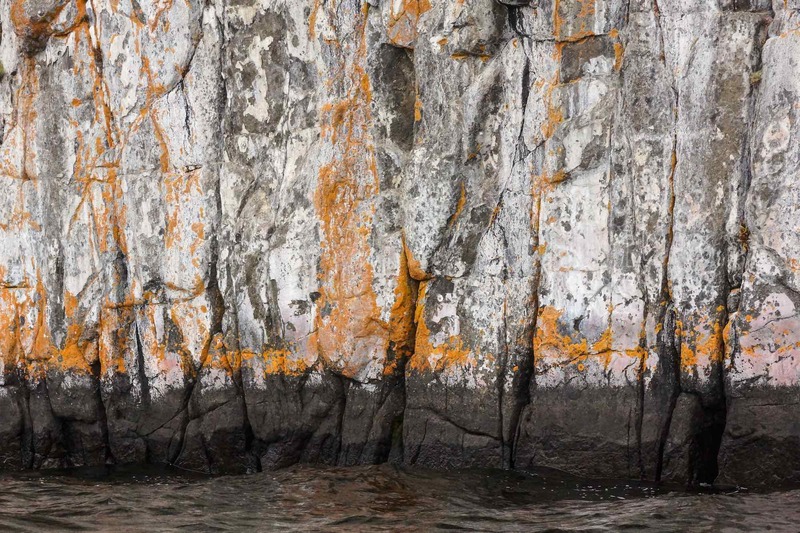 The stretch of rock face in the photo above – and especially the one captured in the image below – are our best guess as to where to pictographs were/are. Blowing up the jpg below 100% revealed what looks like ochre smudges above the water line. That is as close as we got to pictographs! 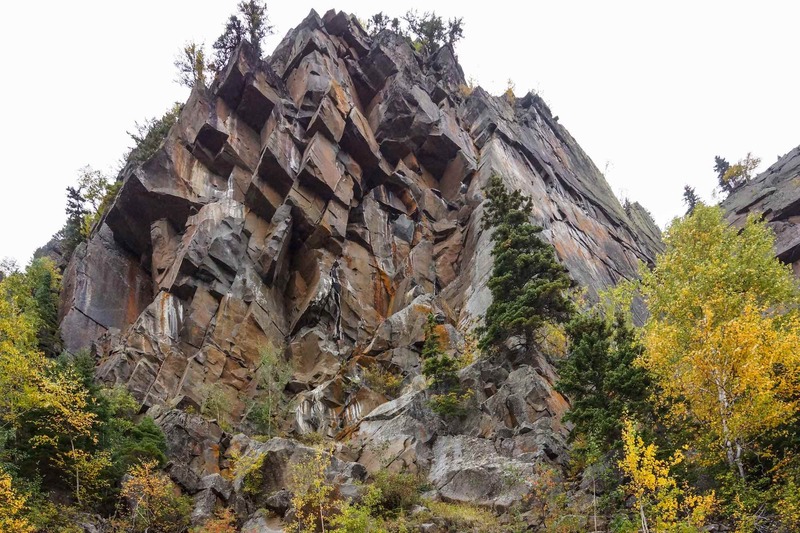 We were, however, awed by the vertical majesty of Undercliff Mountain. Another day and better weather and we would have spent more time there, perhaps climbing up to the top and getting some shots from other perspectives. We would also have spent more time looking for those elusive rock paintings! 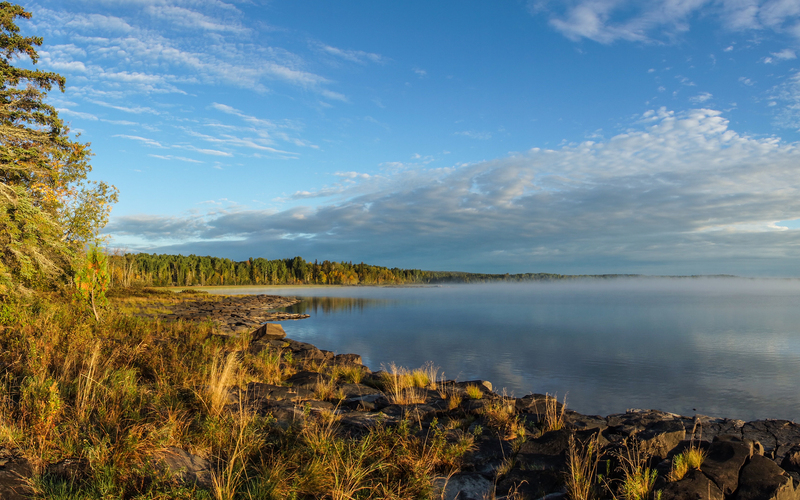 You can see why Anishinaabe shamans of old – or young vision questers looking for a place to leave a physical sign of their connection with the manitous – would be attracted to this place. 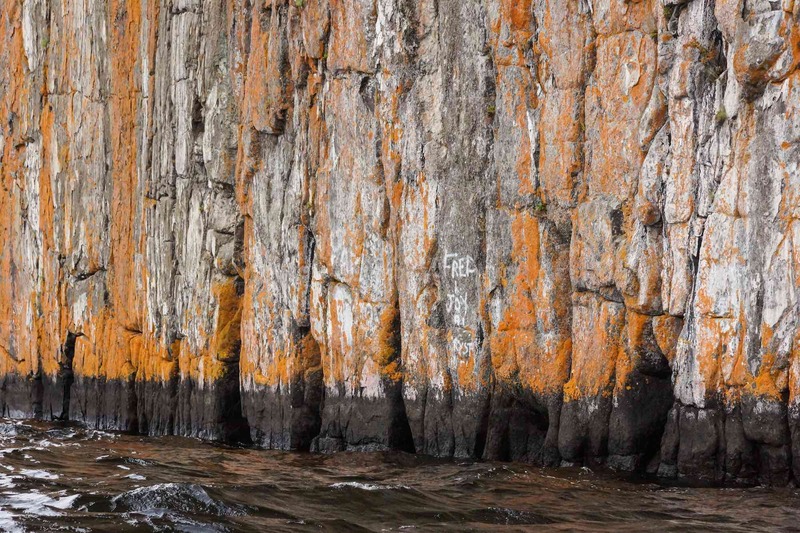 It has the same dramatic sense of special place – of sacred space – that, for example, Mazinaw Rock in eastern Ontario does. There too Algonkian peoples had left their marks on the rock. 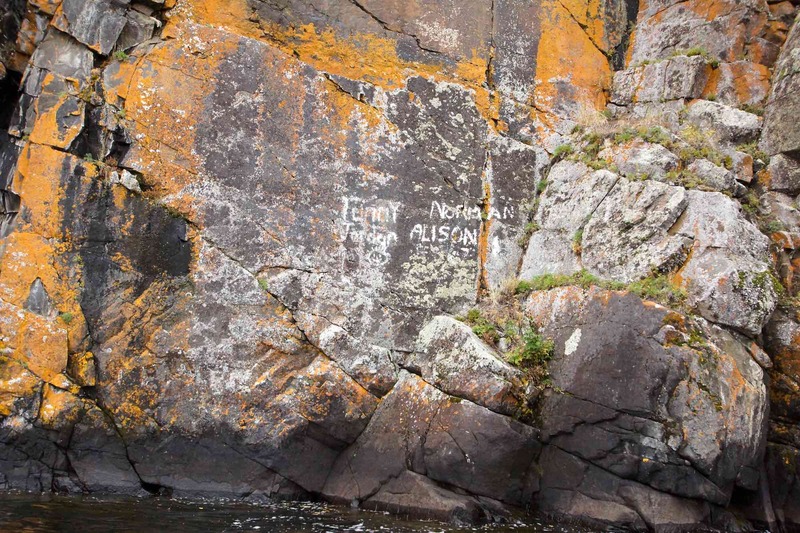 Having said that, it is sad to see that the teens who left the graffiti – probably from nearby Gull Bay First Nation – are so disconnected from their traditional culture that they would deface a site like Echo Rock. 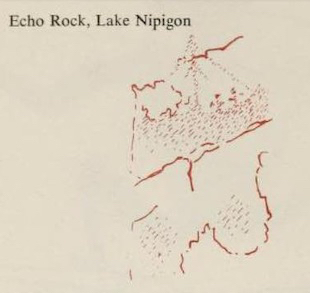 Since the hundreds of pictograph sites scattered across the Canadian Shield, many difficult to get to but some like Echo Rock easily reached by motorboat, cannot all be guarded, another approach is necessary. In the end, there is only one thing can protect these sites and that is education. 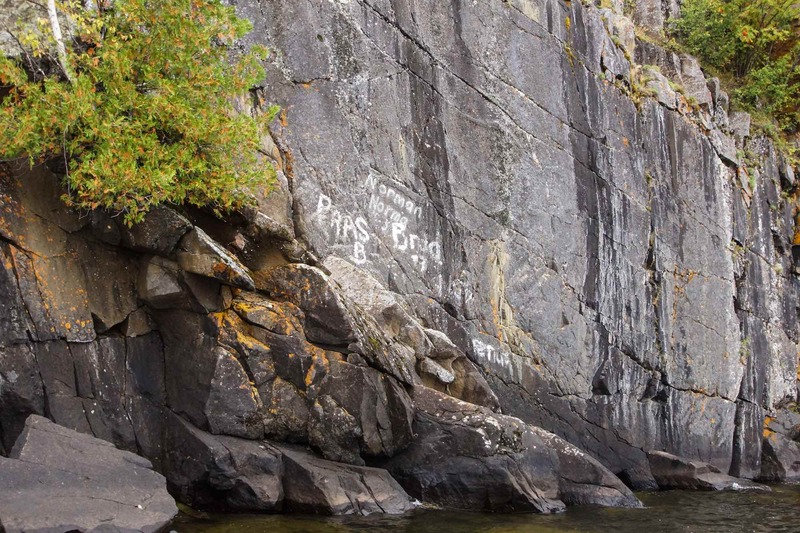 The Echo Rock graffiti represent a “teachable moment’ for the elders nearby who are entrusted with the preservation of key aspects of their traditional culture, even as their young people try to figure out their place in a very different world. 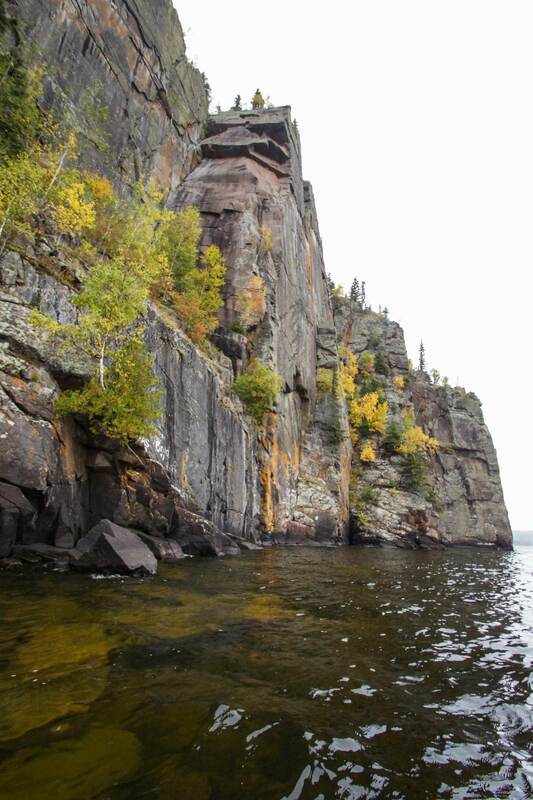 Our visit to Echo Rock done, we paddled north past our campsite into a noticeable north wind. Paddling to Wabinosh Bay was promising to be a solid day of tough paddling! Just north of the campsite is a bay rimmed with a nice sand beach. 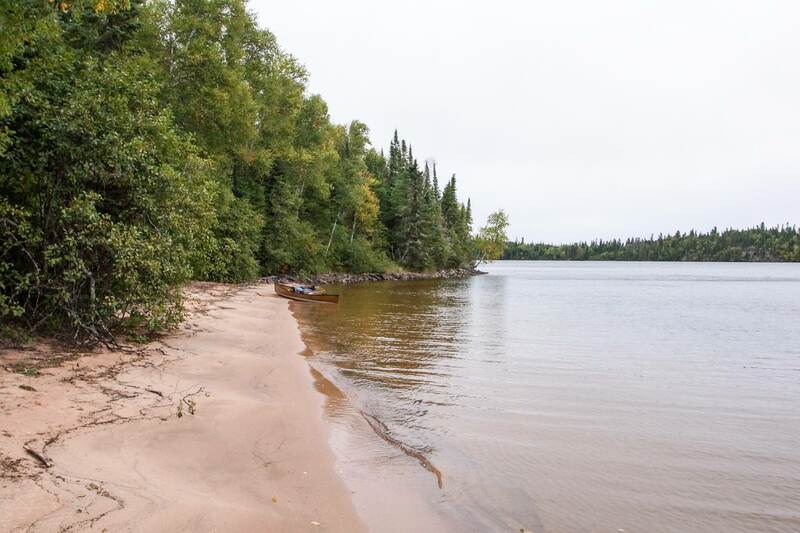 We paddled in to take a look, wondering about the availability of campsites above the sand. We found a couple of potential spots but had to agree that we had made the right choice with the previous night’s campsite with its nice flat spot 4 meters above the water and better views. 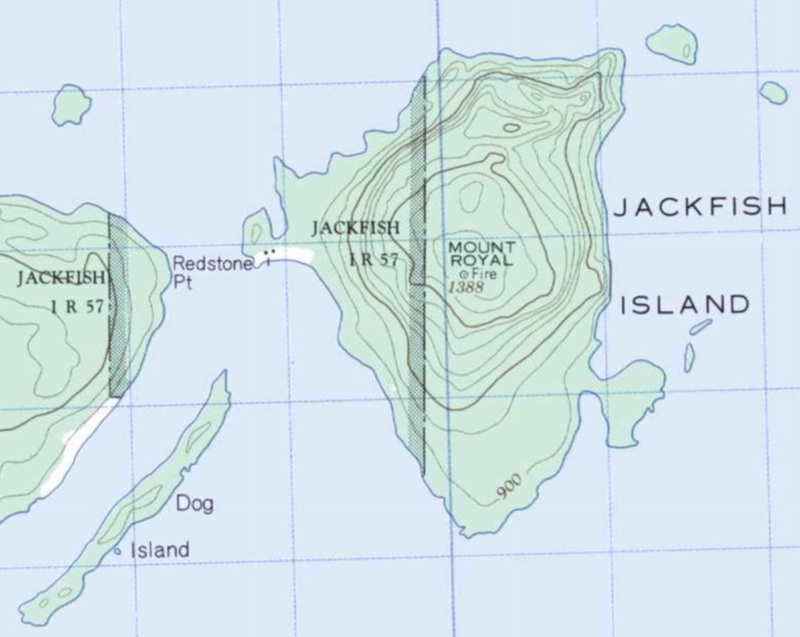 We continued north towards Jackfish Island, curious about the reported site of a Hudson Bay Co. trading post that had existed just south of the island on the mainland across from Dog Island. We figure it was located in the clearing indicated on the map below. As we paddled by there was nothing to see other than tall grass and low-level bush. 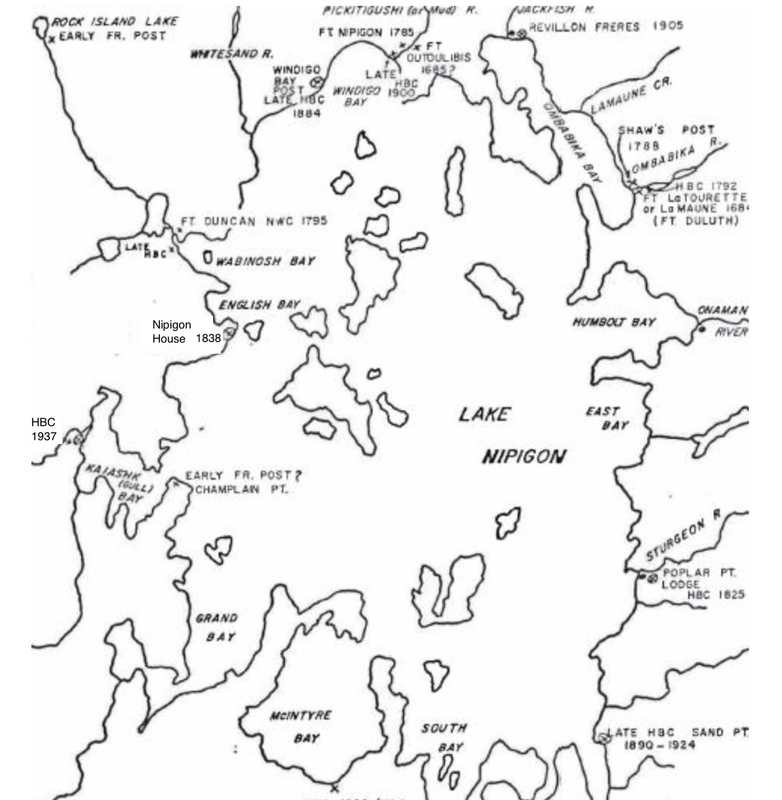 Dawson, a Lakehead U. archaeologist, had spent the summers of 1967-1969 visiting the various Lake Nipigon sites. At this one, he notes evidence of buildings as well as burial grounds. We paddled by the site but did not go ashore to see if there would be any visible remains fifty years after Dawson. We did not know it at the time but we would be back very soon! That white arrow you see on the north end of the clearing is where we put up our tent about an hour later! 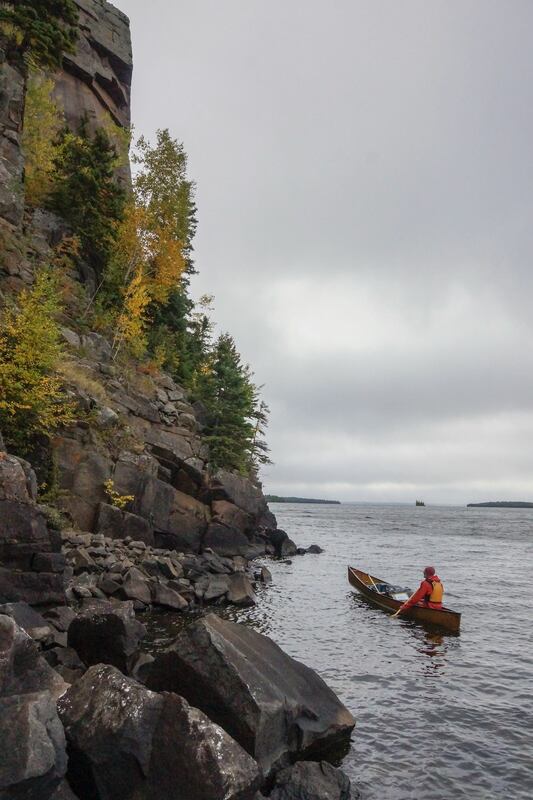 One look back at the site as we paddled north – past the beaver lodge and towards the narrow channel between the mainland and Jackfish Island. The wind was blowing hard, the waves were rolling, and forward progress was difficult. And then the decision to call it a day! Our first thought was to go back to that sandy beach and the decent campsite we had noted there but on our way there we decided, instead to head back to the HBC post site. 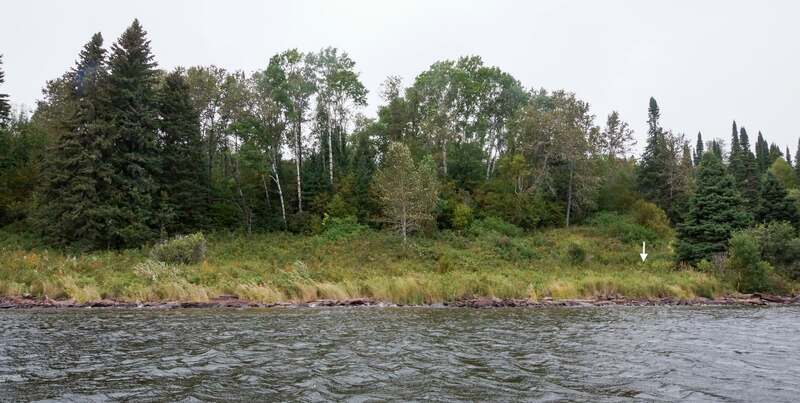 Looking across from our campsite we could see the clearing on Jackfish Island with one building on it. In our pre-trip planning, a visit to the island and a possible walk up to the top of Mount Royal was on our “to do” list. The weather had other plans! The next morning we were keen to cover some distance while the wind was still mild so our visit to Jackfish and a walk up to the fire tower was scrapped – until the next time! The next day’s weather forecast provided by our Garmin inReach Explorer+ looked promising. time: 8:15 a.m to 3:30 p.m.
weather: overcast and cloudy in a.m., cool windy (NE ENE? 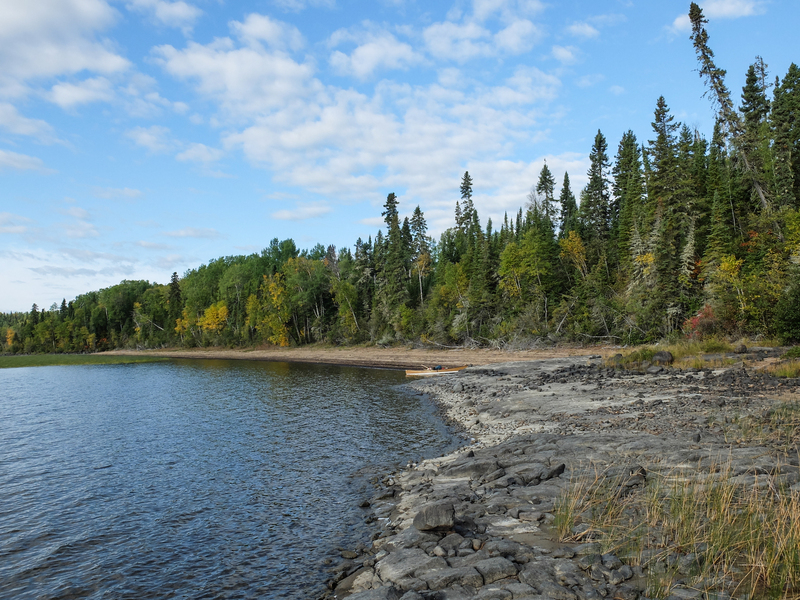 ); sunny periods in p.m.
campsite: 50m into bush 1 x 4 person (trail cleared for ease of access; possible 2-3 x 2 person sites; lakeshore has lots of flattish rock areas good for 2 person tents but would be exposed; Wabakimi Project lists other sites on SW and SE side of the lake. We were up a bit early and keen to get going again. It was ironic that after all our apprehension about the wind and big waves out on Lake Nipigon, we would have to take a wind day once we got back to the mainland shore! We were off by 8:15 and the fact that we only took two photos between that time and our early lunch on Inner Barn Island tells you something about our focus – and of the photo ops! On the way, we did paddle past the northern point of English Bay where a campsite is indicated but we did not stop to check it out. Instead, we headed for Inner Barn Island, one of the more dramatic landmarks in the north section of the lake. 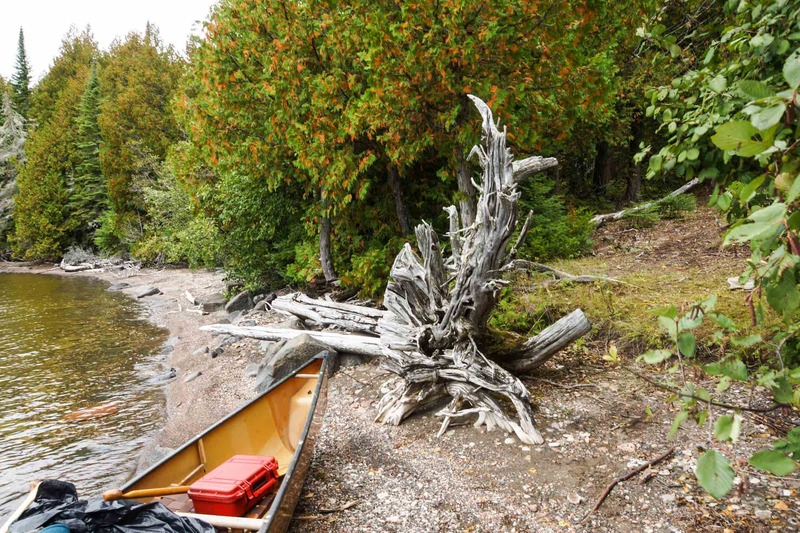 We pulled our canoe ashore for an unusually early lunch – 10:45! – on the beach in a small bay on the south side of Inner Barn. A second mug of coffee to celebrate the last of the big water behind us and to prepare us for the portages up ahead! Thanks to a brief shower timed perfectly to coincide with our brief pause on the island, we put up the tarp. It is a bit over 6 kilometers from our Inner Barn lunch spot to the top of Wabinosh Bay and the beginning of the 290-meter carry on river left of the Wabinosh as we made our way to Wabinosh Lake. We did take one last admiring look back at Inner Barn Island as we approached the top of the bay. We paddled past a weather monitoring station and wondered if this is was the location of another trading post back in the 1800s. The flattish clearing looked like it could accommodate a few tents. However, next to the monitoring station was a “No trespassing” sign! We moved on; it was still early and we figured we’d be on Wabinosh Lake by mid-afternoon. 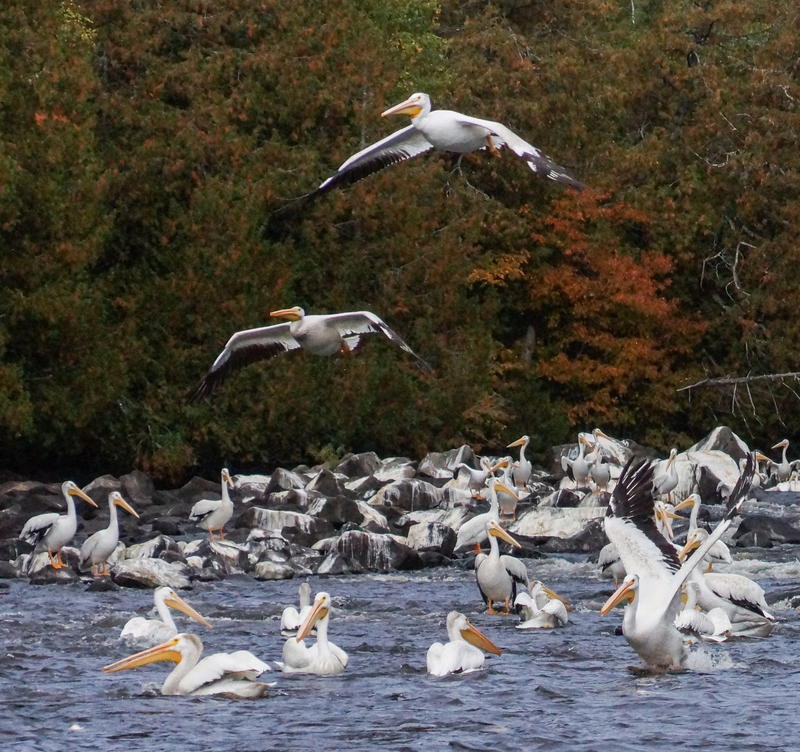 And then – one of those special moments that make a canoe trip unforgettable. [No – not a gruelling 3-kilometer portage!] Until this point we had seen very little wildlife other than a few otters and the occasional eagle. No moose, no bear, no beaver, not even any field mice in the abandoned cabin we had stayed in! What we saw at the mouth of the Wabinosh made up for all the no’s”! 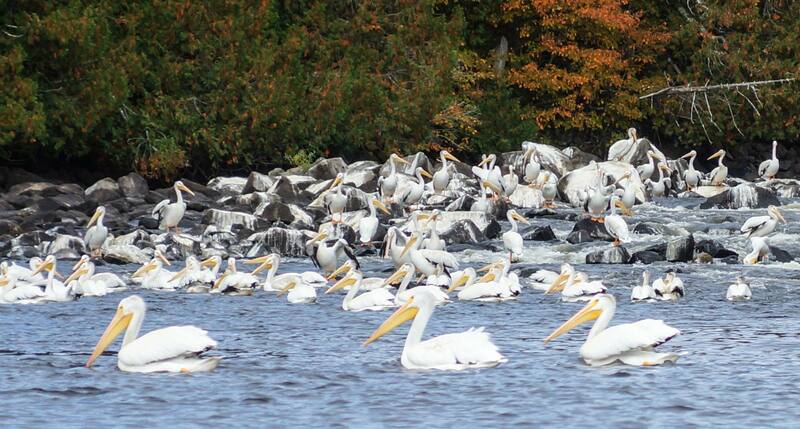 our first view of the mouth of the Wabinosh River – a flock of seagulls? For a certain perspective – a fisherman’s, let’s say – the pelican is nothing more than a vacuum cleaner, sucking up the fish contents of a lake at a frightening rate! The 150 or so gathered at the mouth of the Wabinosh River at bottom of the last set of rapids must have found a certified gold fishing spot. 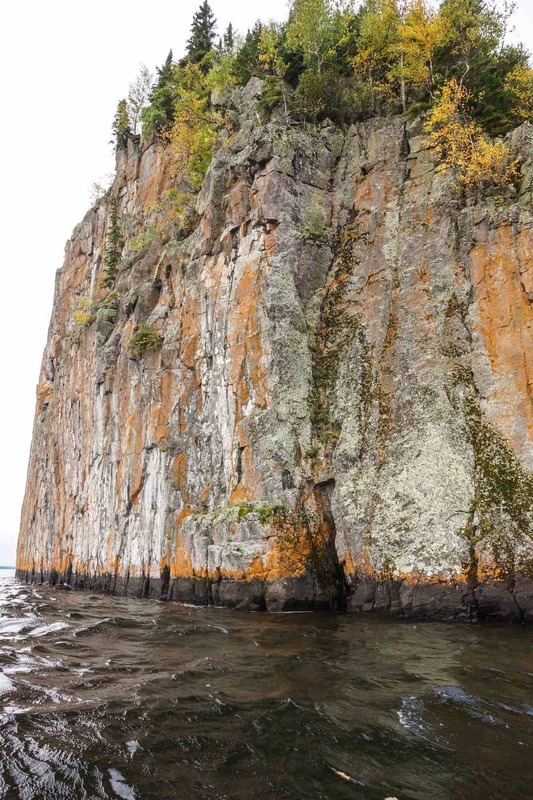 They were first sited on Lake Nipigon in the early 1990s. From afar we thought they were seagulls! And then we saw the first hint of beak flashing in the sun. We spent about ten minutes taking in the scene – and later wondered why we didn’t stay longer and shoot some video of a magical moment. Getting into Wabinosh Lake from the take-out spot took less than an hour – about forty minutes on the portage and then maybe five minutes dealing with a set of swifts that we tracked up on river left without getting our feet wet. 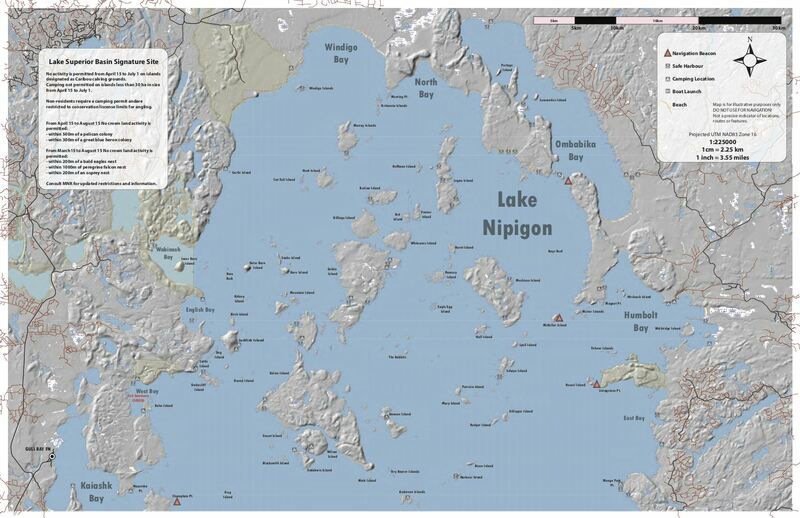 There is a three-meter drop from the lake to the bay; the map below provides the visuals. 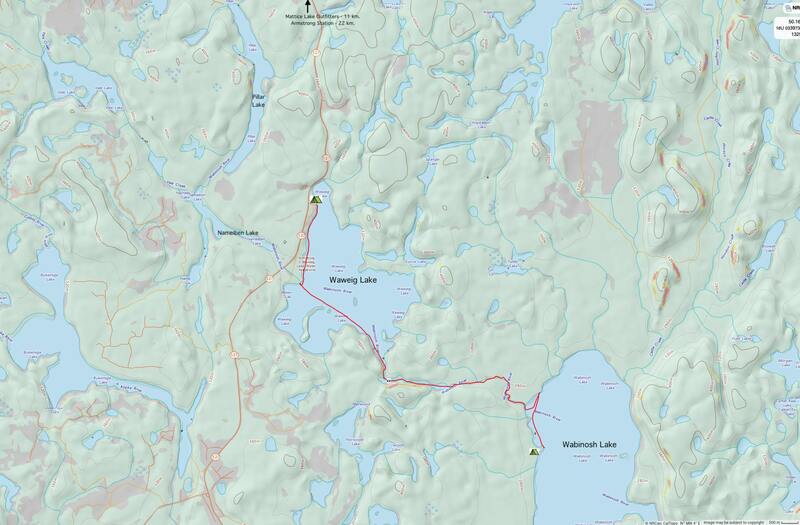 Once on Wabinosh Lake, we paddled to the west side towards a campsite area indicated on our Wabakimi Project map. We did not find our camp spot right away. We walked along the shore and looked for a flat section of rock that would accommodate our four-person tent but we were not seeing anything suitable. It was only when Max followed a rough trail into the bush and about thirty-five meters that we found what we were looking for! It was flat, it was sheltered, and there was earth to push the tent pegs into. The only thing missing was a view! We set up our kitchen on the shore and had a fine view of Wabinosh Lake and enjoyed a rare stretch of the afternoon sun. We also spent a bit of time clearing the trail from our rock patio by the shore to the interior tent spot and put up some orange tape that may save the next passers-by a few minutes as they look for their perfect spot! 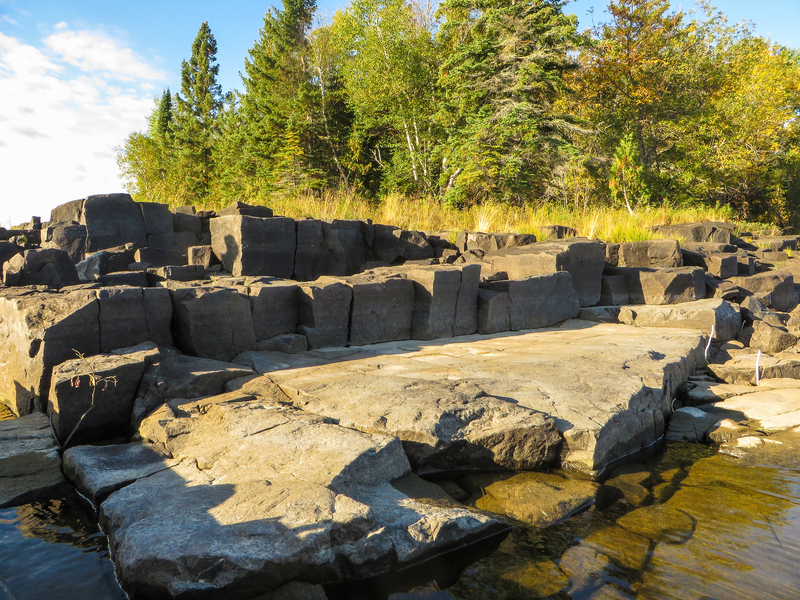 Given the subjective nature of all this, they may well pass up on our tucked-away spot for something on one of those somewhat flat rock surfaces that we dismissed as not quite good enough! Later that afternoon we went looking for any signs of a prisoner-of-war camp from WWII that apparently stood on the west shore of the lake. 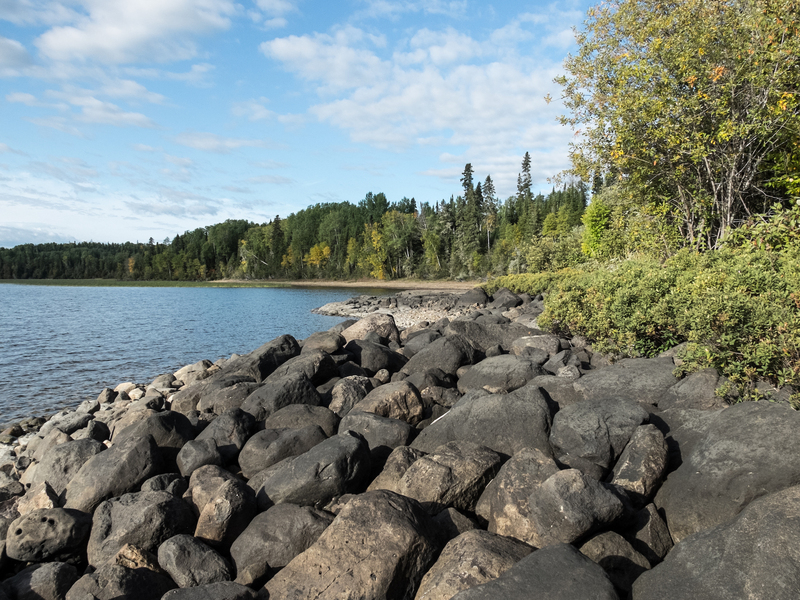 I had emailed Don Elliot of Mattice Lake Outfitters for the location and he had responded that it had been on the west side of the lake near the outlet of the Wabinosh River. With visions of Hogan’s Heroes in my head, I was looking for barbed wire and evidence of enough buildings to house 100 or 200 prisoners. In retrospect, pretty silly! All that we found was a length of steel cable probably used by some lumber operation. Little did we know that we had found something significant related to our search! time: 9:40 a.m to 6:00 p.m.
P1 – 1200m RL (2 hrs.) – rough in spots; be mindful of the tape! L 120m (20 min) tried lining up Wabinosh River; decided to cut the trip short! A beautiful morning on Wabinosh Lake… Max remarked; “What an incredible spot for a POW camp!” After breakfast, we spent a bit more time looking around for evidence that would fit in with our idea of a POW camp. It looked possible but we just were not seeing anything. 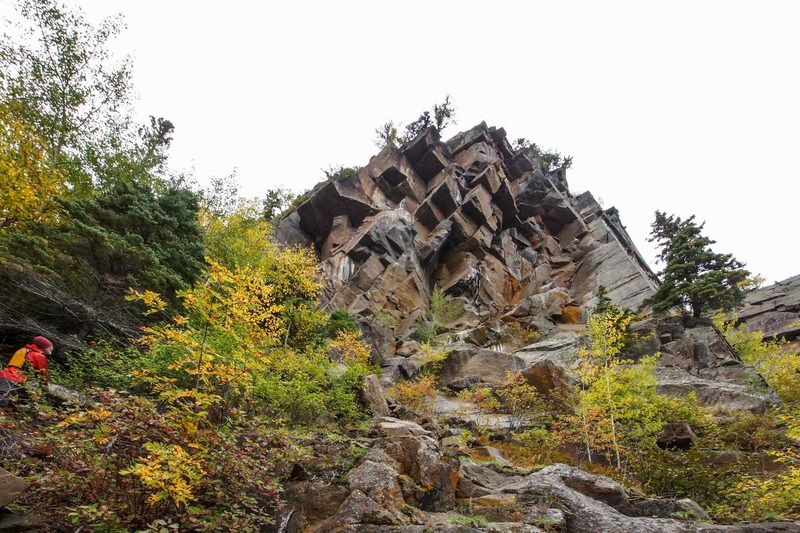 No pictographs, no HBC trading post, and now – no POW camp! Mulling over Don Elliot’s email, we thought that he may have meant to the left of the river outlet and not the right side that we had camped on. That would also fit better with a comment that someone in Armstrong had made when he heard that we would be passing through Wabinosh Lake. He mentioned that there was a POW camp from WWII we should check out. He said it was on one of the small islands on the lake – “not the big one”, he specified. Our map indicated a small island at the north end of the lake. Off we went! We landed at the north end of the sandy beach you see in the image below and walked around for a half-hour, looking for that POW camp. There was nothing there but it was possible to imagine that once upon a time there had been. As we looked north to the top of Wabinosh Lake we could see a small – very small! – island. We considered the possibility of it hosting a POW camp and thought it was pretty pointless, given the size of the island and the fact that you could walk from the island to the shore without getting your navel wet. So much for the Alcatraz of the North that I had created in my mind! We left Wabinosh lake not having found anything except that length of steel cable at our campsite on the westside point. When we got home a few days later, I pursued the question of that POW camp on Wabinosh Lake and ended up with an answer not at all like the one I had imagined. Click on the post title below to see what I found! 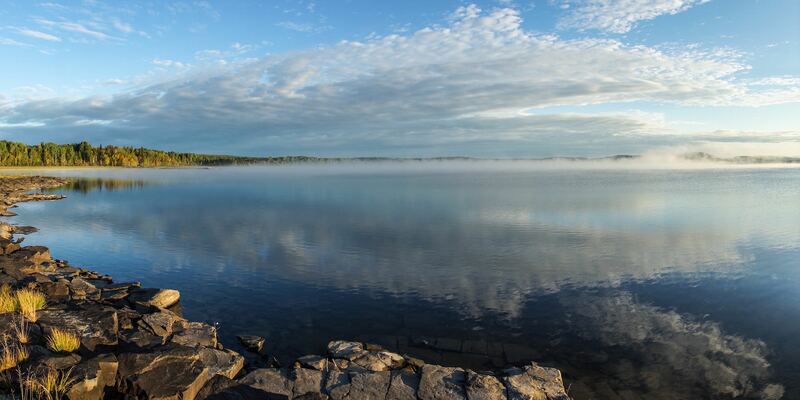 Wabinosh Lake has an elevation of 261 meters a.s.l. Waweig Lake sits at 312 meters. We knew we were in for a bit more work than the previous day’s easy entry into Wabinosh Lake from the bay. Five separate portages, the first one 1200 meters, and none showing signs of very much traffic. Luckily for us, someone – a Wabakimi Project crew? 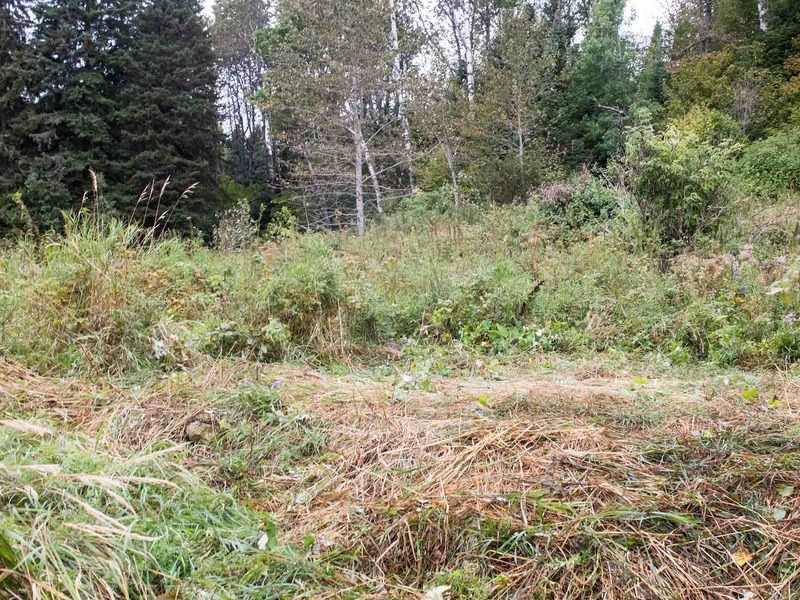 – had taken the time in the past year or two to mark the various trails, as well as doing some cutting and clearing of deadfall and bush. We spent almost five hours on the 5.7 kilometers up the Wabinosh River into Waweig Lake. The image below is the only one we took during all that time! 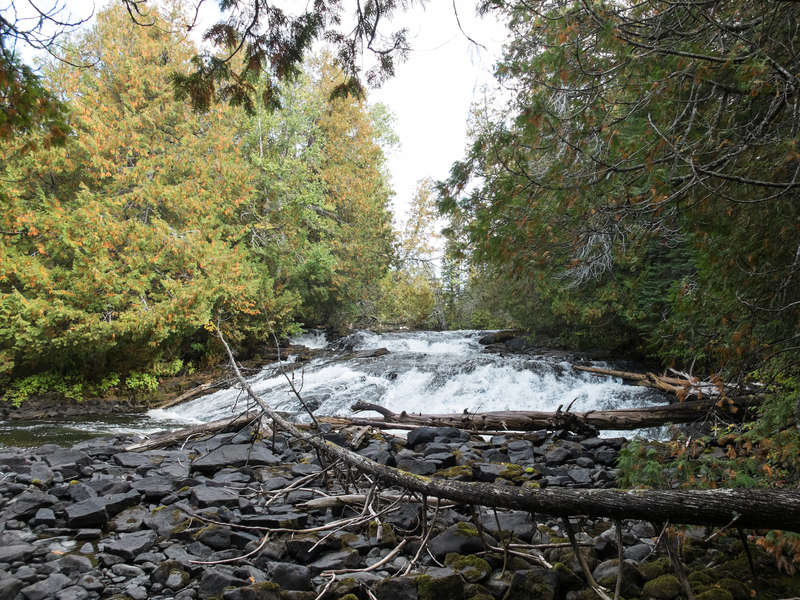 It was taken from the side of the first portage trail, the bottom half of which was arguably in the best shape of any of the “trails” we walked that morning/early afternoon. For the record, here is what a canoe tripper faces in the move up to Waweig from Wabinosh. P1 – 1200m RL (2 hrs) – rough in spots; be mindful of the tape! 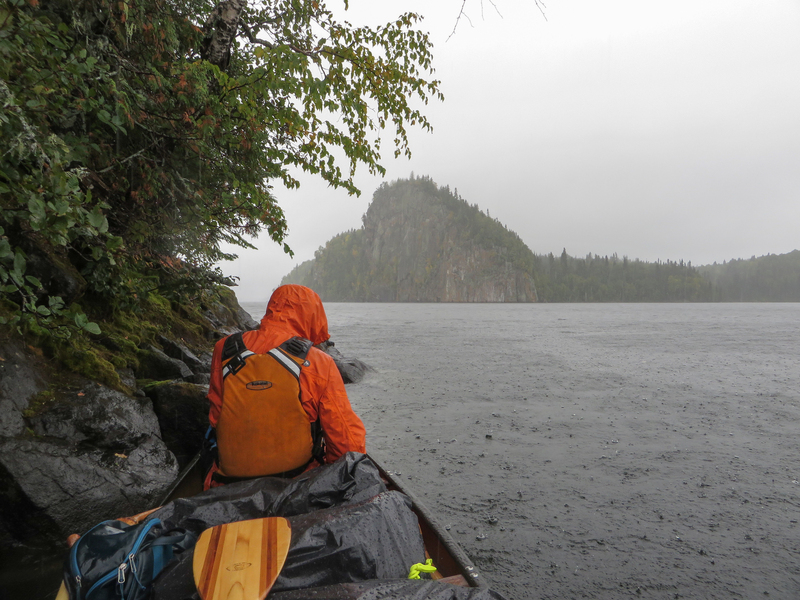 It was raining gently as we paddled to the continuation of the Wabinosh River which would take us up into Nameiben Lake. We had already agreed that we would be doing no more portages that day. 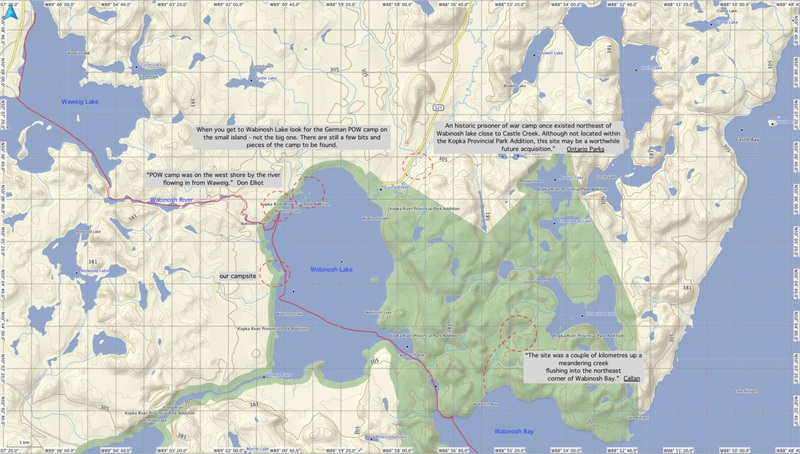 So we didn’t even bother looking for a possible portage trail on either side of the Wabinosh. But lining – somehow that was different! We started our way up the rock-strewn and shallow section of the river. The steepish banks on either side meant we would be walking the canoe up in the middle of the river. Once or twice we lost our footing on the wet rocks as the rain came down. Perhaps at the start of another day with the sun shining overhead, we would have persisted. Long story short – one of us finally said – “Enough already! Let’s pull the plug on this adventure!” or words to that effect. And so we retreated back down to Waweig Lake and paddled along the west shore to the north end. There is a public camping area and boat launch there. 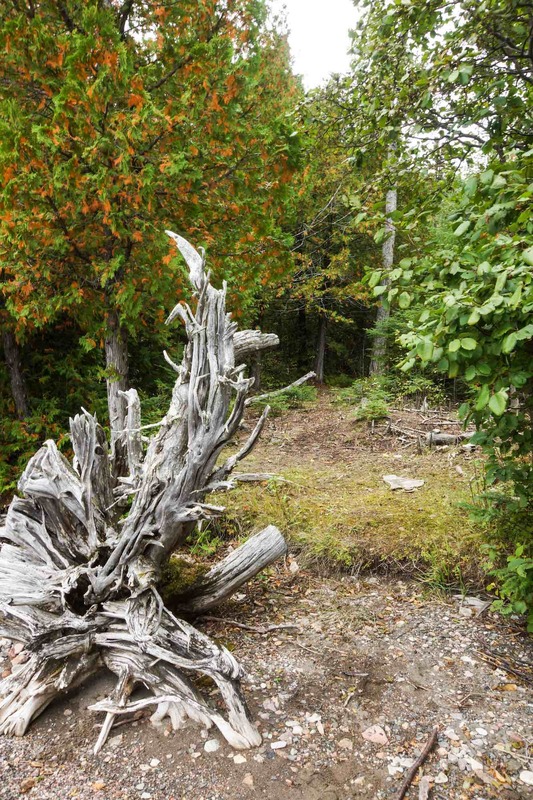 (The area is no longer maintained if the demolished outhouse is any indication.) We found a sheltered spot and made ourselves at home for the night. The next morning when I mentioned to Don Elliot that we were disappointed not to have finished off the trip by paddling right up to lodge dock, he assured us that it would not have been our favourite part of the trip! 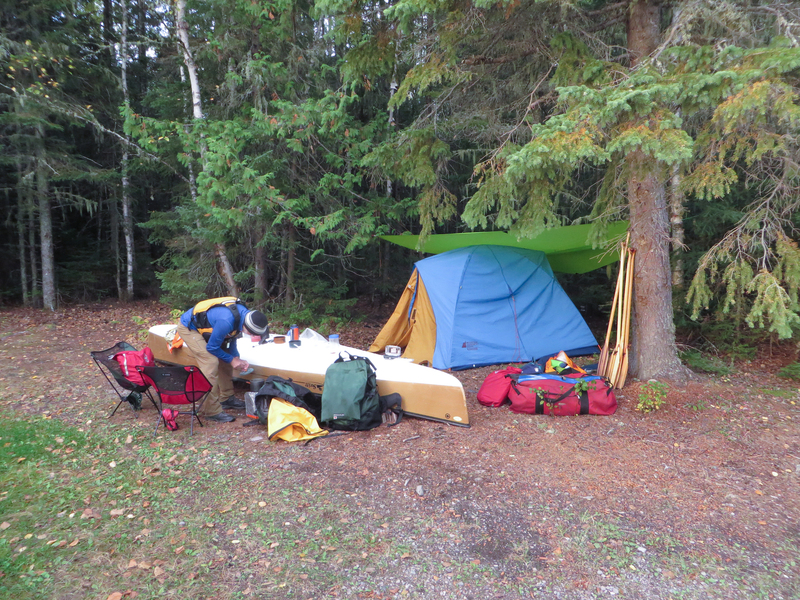 After our tent went up, we also sent an email to Don to arrange for a shuttle back to Mattice Lake the next morning. Given how close it is – about ten kilometers – one of us could have hitched a ride to the outfitters and picked up the vehicle that very night. In neither case would we have started the grand portage back to southern Ontario that night. The next morning we spent an hour at the Mattice Lake headquarters. Waiting for us was the bill for the de Havilland drop off and shuttle from Waweig Lake. Also sitting on the counter were two copies of this year’s edition of the highly sought after Mattice Lake Outfitters cap to add to our collection. 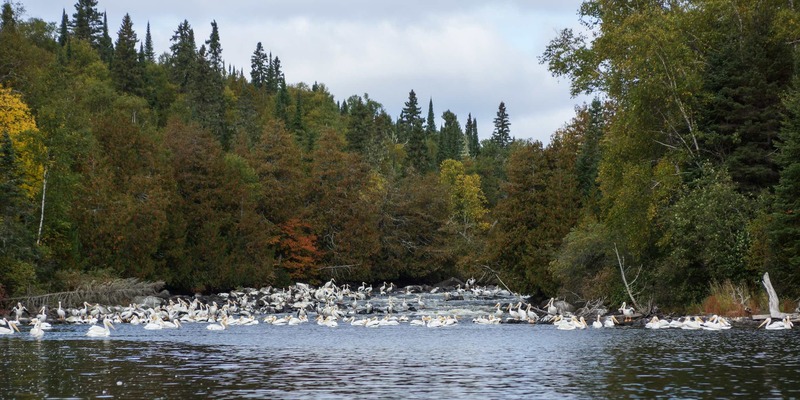 We made use of the shower to freshen up for the 1800-kilometer ride back to southern Ontario and sipped on house coffee while we ran through a few of the highlights – and lowlights – of this year’s visit to the Wabakimi area. And then we hit the road for Le Grand Portage. We left Mattice Lake around 11:00 and by 7:00 p.m. we were in Wawa. The next day was the one when a turbulent weather system from the west blew its way across Ontario. [It was the one which created the tornadoes in the Ottawa area.] We raced it all the way to Toronto, being just an hour or two ahead of it and keeping our fingers crossed when we were travelling in a southward direction, since that was the worst angle for the wind to be hitting the canoe. By 9:00 that night Max was back in London in SW Ontario, having dropped off me and the canoe and most of the gear in downtown Toronto! Now it’s time to plant the seeds of another memorable canoe adventure. Where to next? This entry was posted in Anishinaabek World, Pictographs of the Canadian Shield, Wabakimi, wilderness canoe tripping. Bookmark the permalink. I was with the Wabakimi Project crew that mapped and cleared the Wabinosh lake to Waweig Lake stretch in 2017. Glad to see it found at least some use! 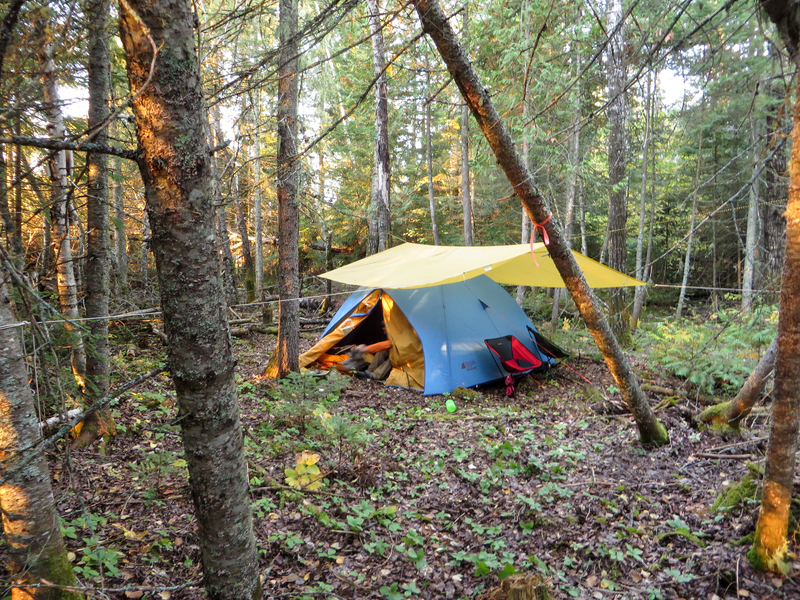 We also cleared those tent pads on the west side of Waweig Lake; glad to read that you found them in the woods; we used the shoreline only for our bench and fireplace… wonder if those were still there. You travelled in one day what took us the better part of a week to map and clear! But that is what we shoot for. 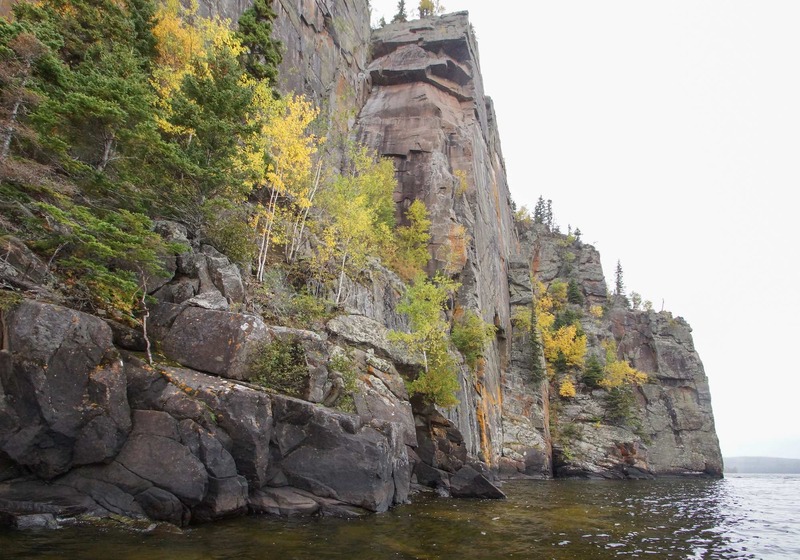 And I agree: that first carry out of Wabinosh Lake (that heads up the ridge after the falls) is challenging. Ray, thanks to you and the rest of the crew for hacking your way up from Wabinosh to Waweig. As rough as we found it, it would have been way worse without your work and that prospectors’ tape! We added some of our own tape in a few sections to make it even more obvious. We did those portages in mid-September at the end of the 2018 season. The trip planning strategy that my brother and I joke about is this – Find out where a Wabakimi Project crew has been the summer before! A few days before we had also done the 1300-meter carry from Derraugh Lake into Pikitigushi Lake, again benefitting from the summer of 2014 work of another Wakbakimi Project team. 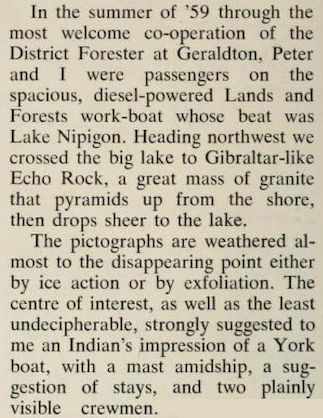 We had gone up to Cliff Lake to see the pictographs again – and to pour a couple of shots of Canadian whisky in the lake in memory of Phil Cotton. BTW – those tent pads. Weren’t they on Wabinosh Lake? 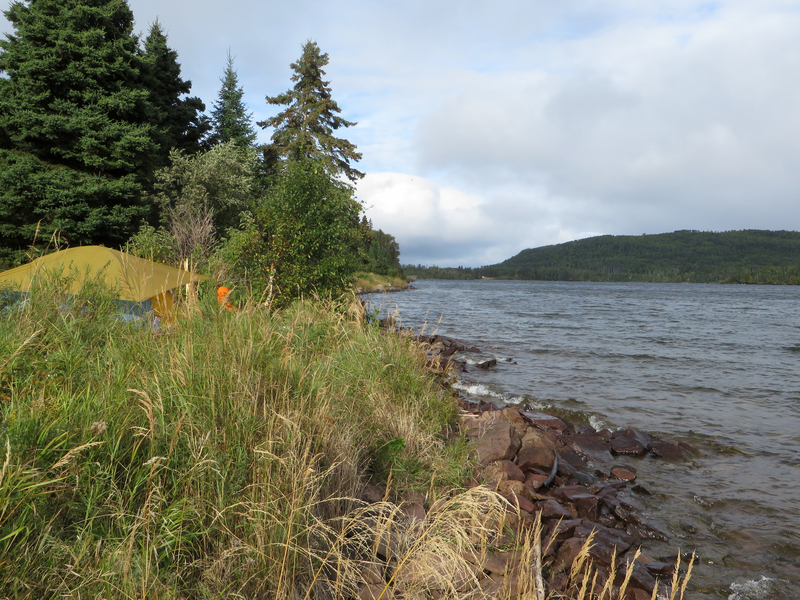 On Waweig we put up our tent in the once-provincial campground at the north end of the lake on the west side. If you and your brother had proceeded up to Nameiben (we scouted and paddled the culvert coming down; you would likely have to carry up and over 527, headed upstream), you would have come to the one spot we have not found and cleared a portage at: the section of river between Nameiben and Pillar. From Pillar, the route to Mattice Lake by going up Mattice Creek (aka Badwater Creek) is mapped and cleared; it is not difficult. 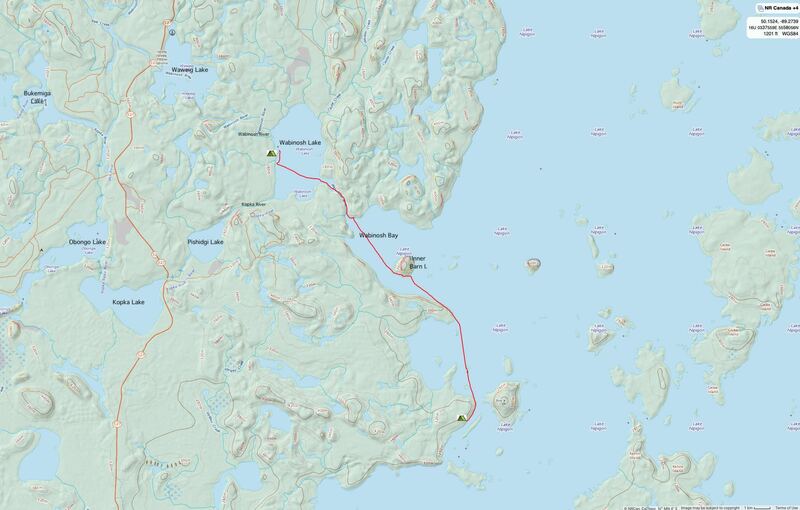 You also wondered about possible shuttles from Gull Bay on Nipigon. Vern Fish and his cousin, Dave Fish paddled the Gull River and got a pick-up at Gull Bay by Mattice Outfitters. I think maybe Don Elliot called the village to get an OK on that. Vern’s trip report is on canoeing.com I think. Happy paddling in the coming season! Ray T.
Ray, after a morning’s worth of portage from Wabinsoh up to Waweig on the trails you guys refreshed, we were not going to do any more portaging that day! It was raining as we headed up the river towards the highway crossing. We did not get very far before deciding to end the trip at the north end of the lake. We never did look for a possible portage trail going from Waweig to Nameiben. 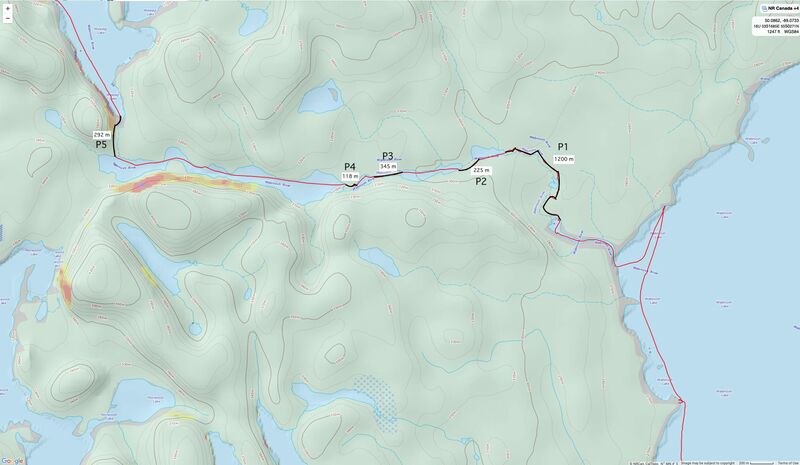 I don’t think The Volume V map set shows a portage trail for that section. It does show the campsite on the west side of Wabinosh that we used, as well as two on the east side of the lake that you mentioned. Definitely no lack of places to put up a tent on Wabinosh! We did not make use of that Cotton fireplace! It was a bit breezy so we retreated to the edge of the bush to take advantage of the windscreen the trees provided. 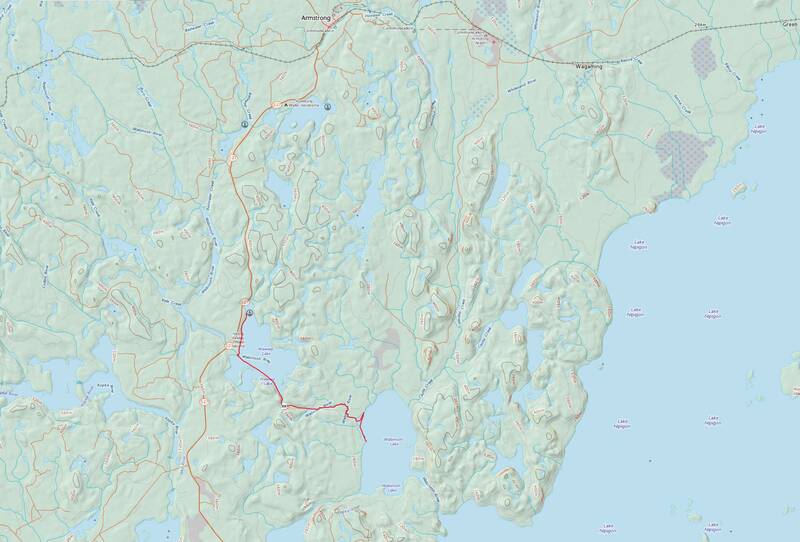 In mid-June we are going to do the French River from Lake Nipissing to Georgian Bay. It is eye-candy canoe country and saturated with multiple layers of history. A big plus is that it only takes us five hours to get to the put-in instead of the two days we spend getting to Wabakimi! I should ask you what the Wabakimi Project crews are working on this summer – it may give us ideas for next summer’s trip! I am sorry to report that 2018 was the last season for Cotton-style weekly service trips. Phil had already planned out a lot of that summer’s route work, and his son and daughter (John and Tricia) graciously allowed us to operate out of his house in Thunder Bay, as had been done for the previous decade and more. Debbie Doyle-Sargent, an old friend of Phil’s and project member in Thunder Bay, did a yeoman’s job of outfitting the food barrels and handling logistics for the crews. I was in for a couple of weeks in June, and contributed to mapping and clearing the route from Kellar Bay on Caribou Lake up to Scallop Lake on the Raymond River (in effect, allowing one to travel up to the Raymond and over and down to Cliff Lake, though a piece over from Scallop Lake to North Annette has not been done by us…) That info is not in the map books, yet. It was bittersweet to stay at Phil’s that final time, to say the least. A goodly number of project members were able to attend his memorial gathering in July, and I drove up from Iowa with my wife for that. He is missed. 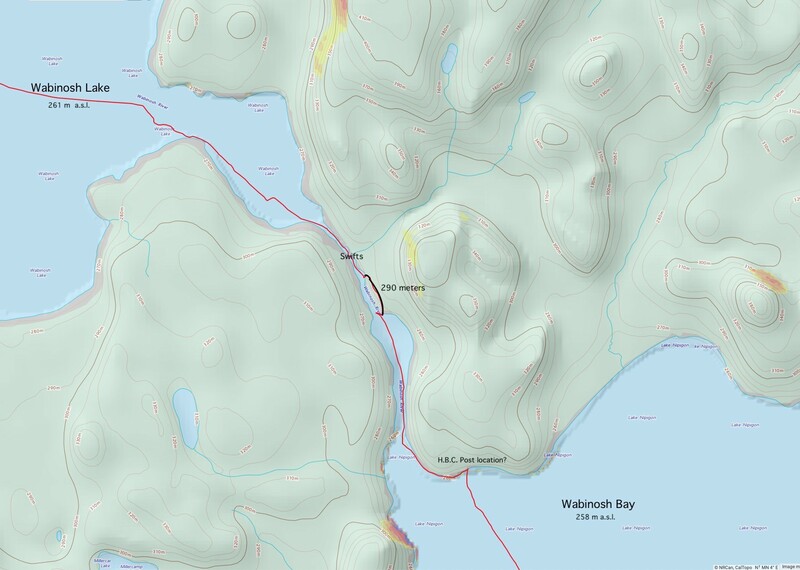 The map books and planning map will continue to be made available through the non-profit group, Friends of Wabakimi, that Phil started around 2015. I think the Wabakimi Project website will be phased into Friends of Wabakimi website, eventually. Barry Simon of Wisconsin has been instrumental in the construction of the map books, and I expect he will likely update them as we check routes and add info. That will be through trips made by ‘Friends’ and other contributors (I am headed up to the north central part of the park with three other ‘Friends’ next June, partly to that end). Debbie Doyle helps with distribution of materials on the Canadian side. Your trip reports are gold for the area, also! The Friends are also considering putting together some form of ‘favorite routes’ book for the Wabakimi area, as some folks have remarked that they have to cut and paste from the current map books to fashion a route… I suspect the trail-clearing part, that the Project was pretty rigorous about, will not be done as thoroughly as in the past. One hopes for some traffic, just to keep the routes fairly open. 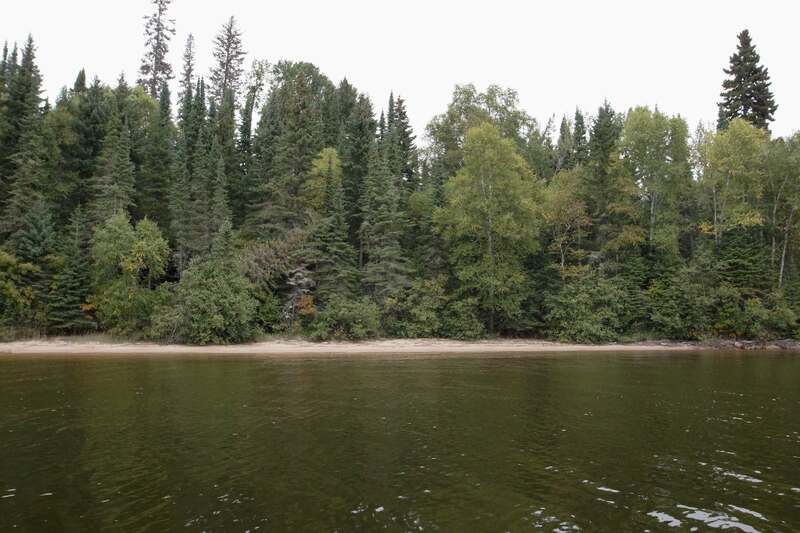 The Park operates on a small crew to try and maintain a lot of portage trail, and the Crown Land areas pretty much just depend on travelers to help out, as they can (unless it is a trail close to a fishing camp lake). French River sounds great. I expect if you listen closely on a quiet morning, you can probably hear the old chansons. Best, Ray T.